For the Demographics of Africa, see Demographics of Africa. For emigration of African people, see Emigration from Africa. For New World populations, see African diaspora. For an overview of individual African peoples, see Ethnic groups in Africa. 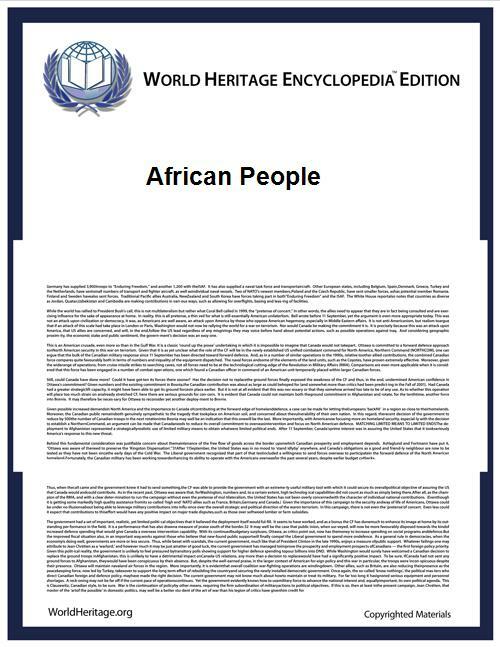 Template:Ethnolinguistic groups in Africa African people are natives or inhabitants of Africa and people of African descent. By 1988 more genetic detail were known, more groups could be distinguished on the basis of genetic information, but the relationships among these groups were accounted as different depending on which was the data was construed. The groups analyzed at this time were Bantu, Berber and North African, Ethiopian, Mbuti Pygmy, Nilotic, San (Bushman), West African. Spencer Wells a geneticist and anthropologist, has traced the migration of the early Africans beyond their own continent by noting the appearance of new genetic markers on the Y-chromosome as the migrations progressed. Studies of mitochondrial DNA conducted within the continent of Africa have shown that the indigenous population has diverged into three divergent main lines of descent. A number of scholars such as Alan Templeton hold that support is found for traditional racial categories only because many studies use the pre-defined categories to begin with, and subsequently insert data into those categories rather than let data speak for itself. Templeton uses modern DNA analysis to argue that human "races" were never "pure", and that human evolution is based on "many locally differentiated populations coexisting at any given time" - a single lineage with many locally gradated variants, all sharing a common fate. It is often taken for granted that the human species is divided in rather homogeneous groups or races, among which biological differences are large. Studies of allele frequencies do not support this view, but they have not been sufficient to rule it out either. We analyzed human molecular diversity at 109 DNA markers, namely 30 microsatellite loci and 79 polymorphic restriction sites (restriction fragment length polymorphism loci) in 16 populations of the world. By partitioning genetic variances at three hierarchical levels of population subdivision, we found that differences between members of the same population account for 84.4% of the total, which is in excellent agreement with estimates based on allele frequencies of classic, protein polymorphisms. Genetic variation remains high even within small population groups. On the average, microsatellite and restriction fragment length polymorphism loci yield identical estimates. Differences among continents represent roughly 1/10 of human molecular diversity, which does not suggest that the racial subdivision of our species reflects any major discontinuity in our genome. The population of North Africa in ancient times consisted predominantly of Berbers in the West and Egyptians in the East. The Semitic Phoenicians and Jews, the Iranian Alans, and the European Greeks, Romans and Vandals settled in North Africa as well. Berber speaking populations constitute significant communities within Morocco and Algeria and are also still present in smaller numbers in Tunisia and Libya. The Tuareg and other often-nomadic peoples are the principal inhabitants of the Saharan interior of North Africa. The Nubians, who developed an ancient civilization in Northeast Africa, are among the predominately Nilo-Saharan-speaking groups found in Sudan, in addition to the Fur, Zaghawa and Nuba, among others. Speakers of non-Bantu Niger–Congo languages predominate in West Africa, with the Yoruba, Igbo, Fulani and Wolof ethnic groups among the largest. There are also Chadic-speaking West Africans in northerly areas bordering the Sahara, most predominately the Hausa, and small numbers of Nilo-Saharan speaking Africans in Nigeria, Chad and the Central African Republic as well such as the Kanuri, Sao and others. Speakers of Bantu languages (part of the Niger–Congo language family) are the majority in southern, central and east Africa proper, due to the Bantu expansion from West Africa. However, there are several Nilotic groups in East Africa, and a few remaining indigenous Khoisan ("San" or "Bushmen") and Pygmy peoples in southern and central Africa, respectively. Bantu-speaking Africans also predominate in Gabon and Equatorial Guinea, and are found in parts of southern Cameroon and southern Somalia. In the Kalahari Desert of Southern Africa, the distinct people known as the Bushmen (also "San", closely related to, but distinct from "Hottentots") have long been present. The San are physically distinct from other Africans and are the pre-Bantu indigenous people of southern Africa. Pygmies are the pre-Bantu indigenous peoples of central Africa. The Arabs arrived from Asia in the seventh century, introducing the Arabic language, and Islam to North Africa. Over several centuries, the majority of the indigenous African population of the region became Arabized by adopting the Arabic language, and developing a common identity with other peoples throughout the Arab World. Today, the majority of North Africans are Arabic-speaking, although the Berber language still predominates among Berber communities in certain areas. Sudan and Mauritania are divided between a mostly Arabized north and a Nilotic south. The Nubians have also been partly Arabized, although their original language is still in use. Commons has media related to Ethnic groups in Africa.